I love this moment from Brandy and Jenee’s Saturday morning wedding ceremony, celebrating their wedding ceremony with a beautiful kiss. 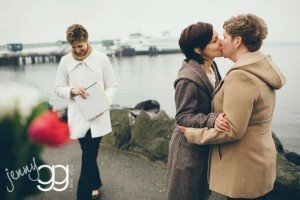 With their closest family and friends at their side, this inspiring couple with a boatload of beautiful and devoted history, exchanged vows on the Edmonds waterfront last Saturday – lots of joy, fabulous donuts, wind and chill and more. I’m always touched by the number of couples each year who brave Winter elements to be married “at their special place.” And I’ve found that the enormity of a lifetime moment eclipses any challenges of being outside in the cold! Brandy and Jenee – so much love to both of you!